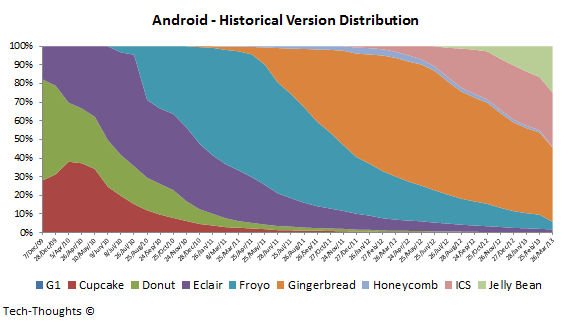 Google recently released an update to its monthly Android version distribution data, which showed Jelly Bean making strong gains at the expense of Gingerbread. Google also announced a change in the data collection methodology. The new methodology tracked active usage of the Google Play Store as opposed to measuring just active devices, i.e. devices pinging Google servers. The new data is obviously more useful to developers, but it could also help us understand the proportion of Android users who actively use Google Play. Let's begin by defining the terms we will be using in this post. "Active Devices" refers to all Android devices (with Google services) in use, while "Active Users" refers to Android users that have visited the Google Play Store over the data collection period. The two data sets (active devices vs. active users) are not particularly useful without a connecting link. Luckily, Android 4.2 may be just that. Google's "Active User" distribution data was collected in the two weeks leading up to April 2nd, 2013. In this period, the only major devices using Android 4.2 were Google's Nexus line of devices (Galaxy Nexus, Nexus 4, Nexus 7, Nexus 10) and possibly certain devices running custom firmware. Early adopters and tech enthusiasts probably make up the vast majority of the user base for these devices and all of them should fall under "Active Users". However, to be safe, we can consider that proportion to be 90-95% of "Active Devices" running Android 4.2. 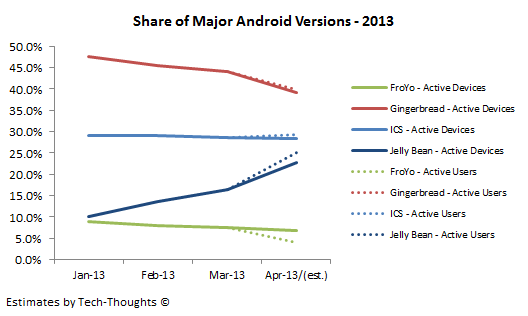 As the chart above shows, Android 4.2 has seen linear growth over the past 3 months. Sales of Nexus devices shouldn't be radically different running up to April, based on which I've estimated Android 4.2's share of "Active Devices" to increase to 1.8% in April. 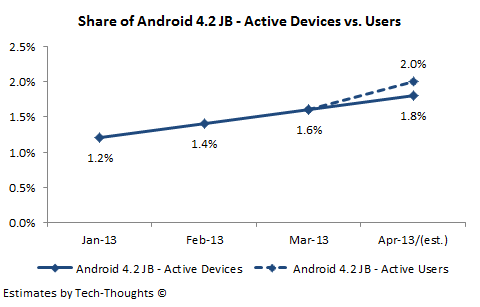 However, Google's data on "Active Users" showed Android 4.2 share at 2.0%. Using our "Active User" assumption for Android 4.2 devices, we can estimate that "Active Users" form 81-86% of all "Active Devices", across all Android versions. Unsurprisingly, Jelly Bean (incl. both 4.1 & 4.2) has the highest share of "Active Users", with 94%. 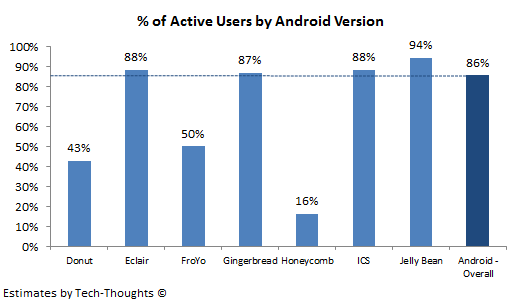 The proportion of "Active Users" on ICS and Gingerbread is practically the same (marginally above the overall average for Android). This reinforces the fact that showed that the widely quoted engagement issue on Gingerbread was a browser engagement issue and not a user engagement issue. User engagement, as measured by visits to the Google Play Store, doesn't seem to be a problem for devices on major Android versions.